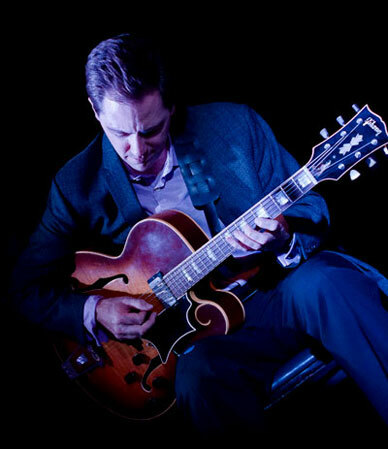 Since coming to Chicago in 2003, Andy has been fortunate to work at many of the area's finest jazz venues with his own bands, as well as playing his unique brand of solo jazz guitar. He has backed visiting jazz names at places including The Jazz Showcase and the Harris Theater. Currently he plays solo guitar every Thursday at The Green Mill, leads his quartet every Wednesday at Andy's Jazz Club and performs with his trio bi-weekly at Winter’s Jazz Club. His love of great tunes, as well as accompanying skills have made him a favorite with vocalists. Married to frequent partner vocalist Petra van Nuis, Andy has worked with many of Chicago's finest singers. Andy also had the good fortune to accompany Barbra Streisand when she appeared on the Oprah Winfrey Show in 2009. Andy has made many festival and club appearances around the world. Highlights include Dizzy’s Club at Jazz at Lincoln Center, the Chautauqua Jazz Party, the Chicago Jazz Festival, the Cleveland Jazz Party, as well as festivals in Rio de Janeiro, the Netherlands, Germany and throughout the United States. Andy has provided the music for a wide variety of parties and private events. In 2012, his trio was invited by the Chicago Mayor's office to perform for the Nobel Peace Prize dinner in Chicago where invited guests included U.S. presidents Bill Clinton and Jimmy Carter, as well as the Dalai Lama and Mikhail Gorbachev. Also in 2012, Andy's trio was hired by the U.S. State Department to provide music for the opening night gala at the NATO summit held in Chicago. Andy enjoys being a member of several bands besides his own. He works often with vocalist Petra van Nuis, either in duo or larger groups, including Petra's Recession Seven. They have worked together all over Chicago and in venues throughout the country, as well as tours of Europe and Canada. Since 2009, Andy has co-led a two-guitar quartet with renowned guitarist Howard Alden. In 2013, Delmark Records released a CD of the group entitled "Heavy Artillery" which received four stars in Downbeat magazine and was featured in their annual Albums Of The Year issue. Andy plays regularly with jazz mandolinist Don Stiernberg's trio. They have worked at festivals in Germany and Brazil, as well as throughout the United States. He is also a member of trombonist Russ Phillips' group, both with Russ' Quartet and his Windy City All-Stars. Andy has been featured on a wide array of recordings. As a leader, his latest is the 2016 Delmark Records release “Direct Call” which received four stars in Downbeat magazine. His previous Delmark release “Soloist” was his first solo jazz guitar recording and received warm reviews from critics and fans alike. 2015 marked the release of organist Chris Foreman's debut recording "Now Is The Time” which featured Andy on several cuts. In 2016, mandolinist Don Stiernberg released a CD titled “Good Numbers” featuring Andy on acoustic archtop guitar. Andy has collaborated on four CDs with Petra van Nuis, the most recent being their 2017 duet release “Lessons Lyrical." Andy had the good fortune to learn directly from several guitar masters, including Cal Collins, Ted Greene, and Howard Alden. His most important mentor was the late Kenny Poole, who called Andy his protégé. "One of Chicago’s most appealing jazz guitarists…uncounted Chicago jazz artists have collaborated with Brown on club dates and recording sessions, and they know better than anyone the depth of his work and unpretentiousness of his manner…for all his easygoing virtuosity, he places the emphasis on musical phrase rather than pyrotechnics." "An uncommonly good player, with a modesty that brings to mind the fine Canadian guitarist Ed Bickert and a warmth suggestive of Joe Pass...has a gift for melody and plenty of rhythmic confidence...projects a naturalness when phrasing, and his overall intelligence makes understatement and subtlety virtues." "Brown is a world-class guitarist who is more than capable of giving a clinic on accompaniment and solo guitar performance." "Brown manages to wrap his rich harmonic style in a unhurried feel that calls to mind the spirit of George Van Eps with a current harmonic understanding...over-flowing with skill and imagination"
"Andy Brown is not about flash and dazzle but about nuance and tastefulness."